On the very first day of trading in the New Year, Friday Jan 2nd , the US dollar went on a tear against all its major counterparts. The rate for the Greenback against the Euro is now at its lowest level in four-a-half years. Talk of the imminent introduction of Quantitative Easing (QE) by the European Central Bank (ECB) has not helped the Single Currency, but the dollar story is the same against all major global currencies, most notably the Pound Sterling. The market has apparently taken on board the narrative that says that the US economy is, at last, moving into what can only be described as normality from the standpoint of the US monetary authorities, which also implies that the next item on the agenda is the raising of US core interest rates. How low can EURUSD go? Technically, there is quite a bit of white space between the current exchange rate and the bottom of the long-term down channel (see chart above). 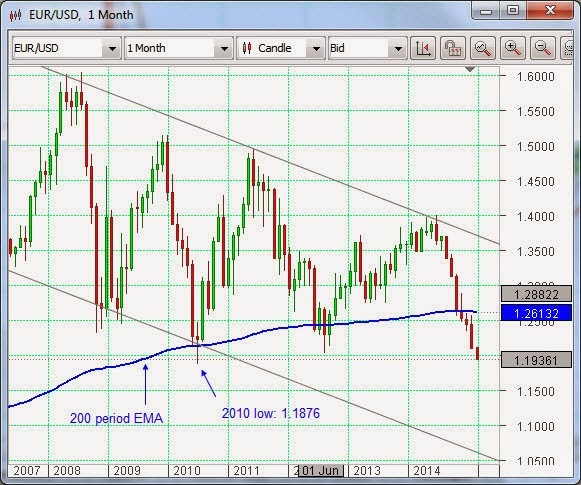 Price has powered through the 200 month Exponential Moving Average (EMA) to the downside. However, the 2010 low does represent a significant level of support. After that we are pretty much into uncharted waters. On previous occasions when the Euro suffered a large decline, the blame for it could be laid at the doors of those recalcitrant EU member states that were struggling with their government finances. Chief among these was Greece. Now there is more tension coming from that quarter, with the failure of the parliament to elect a president, making a general election an inevitable requirement under the constitution. There has been a rise in the support of the electorate for the anti-austerity party, Syriza, and the possibility exists that it will gain power. Although the practicalities of the situation are not in favour of it, the momentum that has been built up could lead to a deliberate default on Greek sovereign debt. In the past, even the hint of such a possibility would have affected all other Eurozone member states, but that has not happened on this occasion. 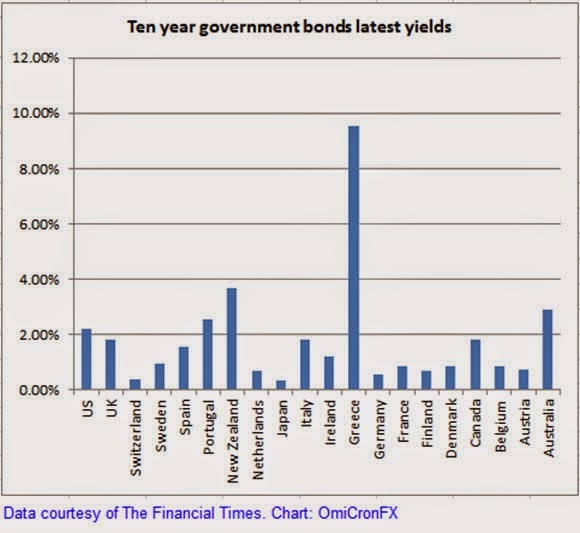 Illustrated are the yields on government bonds from around the world. The “sore-thumb” standout is Greece. Other countries that show elevated levels do so for reasons that are the polar opposite of that country’s situation – they are either relatively high core interest rate nations, such as Australia and New Zealand or, in the view of the bond market, are about to become so, for example the US and the UK and so are places, unlike Greece, where people wish to deposit their funds.